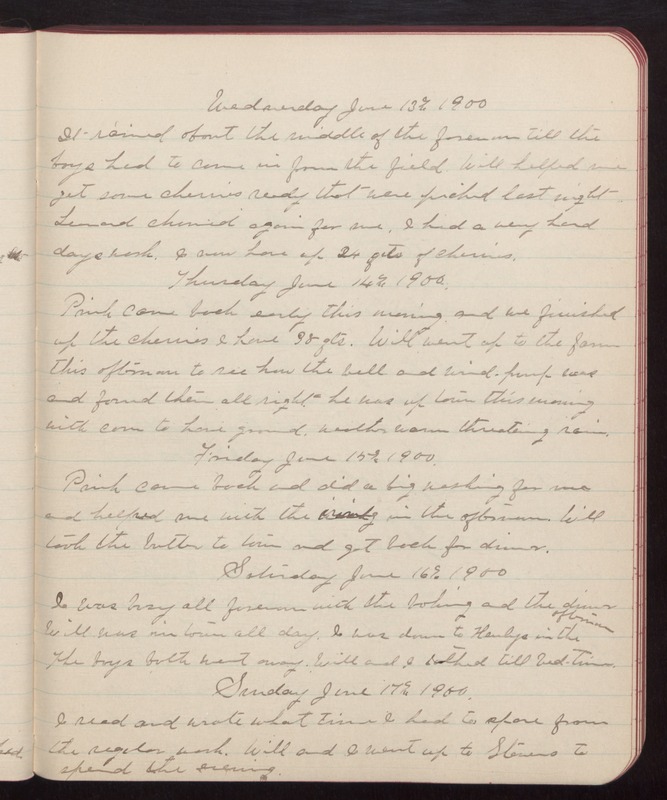 Wednesday June 13th 1900 It rained about the middle of the forenoon till the boys had to come in from the field. Will helped me get some cherries ready that were picked last night Leonard churned again for me. I had a very hard days work. I now have up 24 qts of cherries. Thursday June 14th 1900 Prish came back early this morning and we finished up the cherries I have 98 qts. Will went up to the farm this afternoon to see how the well and wind-pump was and found them all right. he was up town this morning with corn to have ground. Weather warm threatening rain. Friday June 15th 1900 Prish came back and did a big washing for me and helped me with the ironing in the afternoon. Will took the butter to town and got back for dinner. Saturday June 16th 1900 I was busy all forenoon with the baking and the dinner Will was in town all day. I was down to Henlys in the afternoon The boys both went away. Will and I talked till bed-time. Sunday June 17th 1900. I read and wrote what time I had to spare from the regular work. Will and I went up to Stevens to spend the evening.